"Why Do We Pray to the Saints?" “And as for the resurrection of the dead, have you not read what was said to you by God, ‘I am the God of Abraham, and the God of Isaac, and the God of Jacob?’ He is not the God of the dead, but of the living” (Matt 22: 31-32). 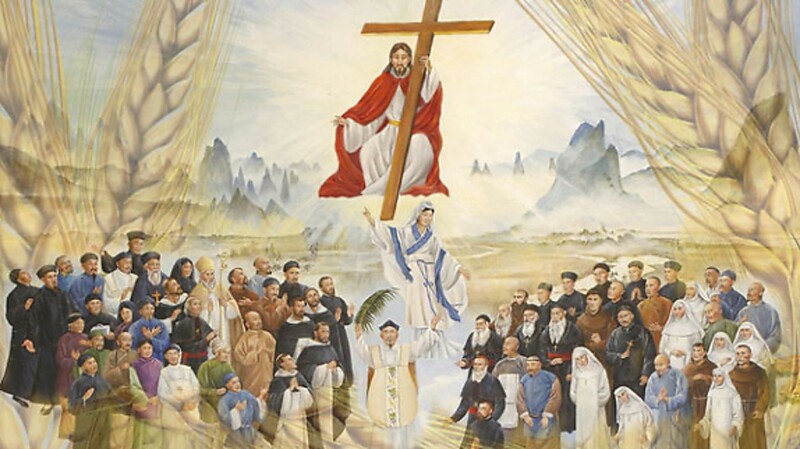 Why do Catholics pray to the Saints? Why not pray directly to Jesus? This is a question Catholics often get asked; unfortunately, most Catholics do not know how to answer. First and foremost, we need to look at what the Church teaches on the subject, and for that we turn to the Catechism of the Catholic Church, Paragraph 2683: The witnesses who have preceded us into the kingdom, especially those whom the Church recognizes as saints, share in the living tradition of prayer by the example of their lives, the transmission of their writings, and their prayer today. They contemplate God, praise Him, and constantly care for those whom they have left on earth. When they entered into the joy of their Master, they were "put in charge of many things." Their intercession is their most exalted service to God's plan. We can and should ask them to intercede for us and for the whole world. The first thing that needs to be pointed out is that we do not pray to the saints in the same manner that we pray to God. God alone has the power to grant or deny our petitions. When we pray to the saints we only ask for their intercession; in other words, we ask them to pray for us. Some may object that the Bible says that there is only one mediator between God and man, Jesus: "For there is one God, and there is one mediator between God and men, the man Christ Jesus" (1 Tim. 2:5). This is true. However, most non-Catholics have no problem asking a family member or friend to pray for them; and asking one person to pray for you in no way violates Christ’s mediatorship. Why not? Dr. Scott Hahn points out that: “First, the Greek word used here for 'one' is eis, which means 'first' or 'primary,' not monos, which means 'only' or 'sole.' Just as there is one mediator, there is also one Divine Sonship, which we all share—by way of participation—with Christ.” Because we are all part of the one Mystical Body of Christ, we share in His roles and participate in them. Finally, some may say, ”The saints are dead; they cannot hear you and the Bible forbids communicating with the dead” (for example, Deuteronomy 18:10-11), but necromancy was the practice of conjuring up the dead through wizards or mediums in order to manipulate the spiritual realm or foresee the future, which is categorically different from asking our brothers and sisters in Christ who have passed on to pray for us. Furthermore, the Book of Revelation shows that the saints in Heaven are clearly aware of what is happening on earth (Rev 5:8, Rev 6:10). Scripture says we are surrounded by a great cloud of witnesses (Hebrews 12:1). These are the saints who have "run the race" here on earth and are now cheering us on in Heaven. They are perfected in love because they are in the presence of God—who is Love. To love is to will the good of another, and that is what the saints do. They will that we attain the greatest good of all: God. That is why we ask them to pray with us and for us.